The team at TRUE creative services was thrilled to be chosen by the VP of marketing at ISS to consult on and implement the designs for their corporate identity materials and trade show. 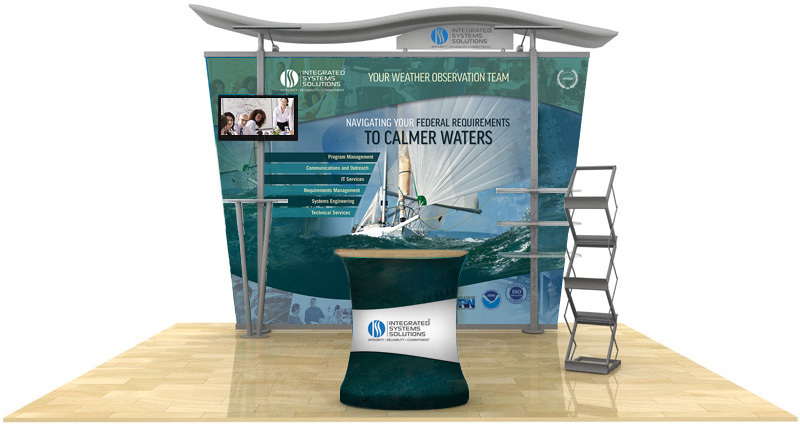 Using compelling messaging, imagery and the selection of a modern and eye-catching structure, we were able to create a stunning and creative display that set their display apart from all other exhibitors. Integrated Systems Solutions, Inc. (ISS) is a service disabled, veteran-owned small business (SDVOSB) that provides high-value professional services in program management, communications and outreach, IT services, requirements management, systems engineering and technical services to government agencies. The ISS senior management team has extensive experience in support of numerous agency initiatives at the National Oceanic and Atmospheric Administration, Defense Logistics Agency, Veterans Administration, DoD and General Services Administration.